Subwoofers have been designed with electro-acoustic parameters that maximize performance for the factory box available below the seats. 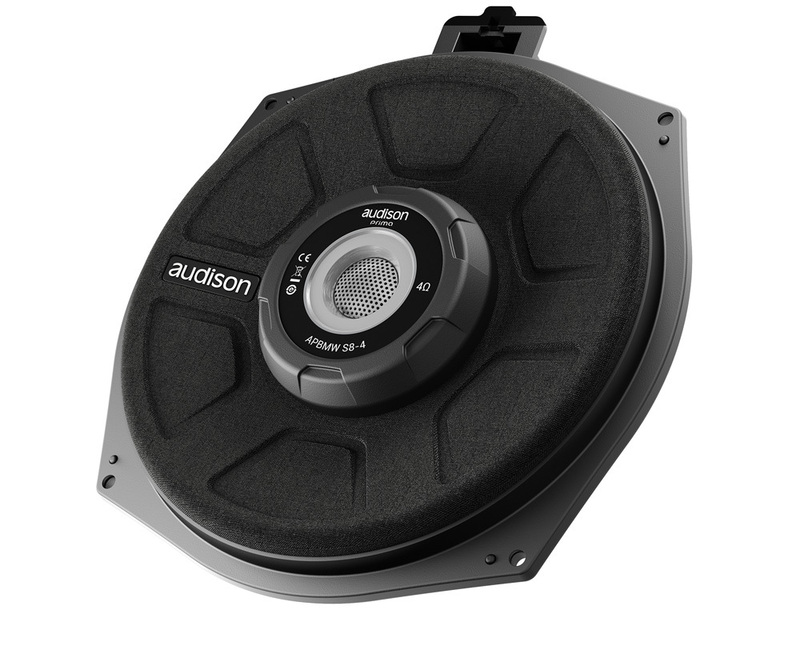 The ABS plastic basket, reinforced with fiberglass, and the acoustic structure featuring a front magnet, provide for a minimal installation depth for a perfect compatibility with the whole range. Two 5 mm polyurethane gaskets, supplied, allow the subwoofer to fit perfectly to the box, decoupling it from vibration. The 200 mm (8″) APBMW S subwoofers allow a “direct replacement” of the OEM speakers underneath the front seats, making the most of the factory acoustic load and generating deep and crisp low frequencies. 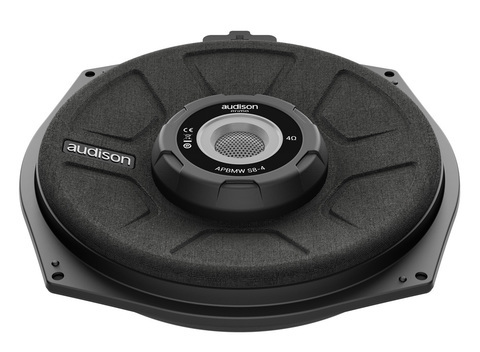 You can choose between S8-2 with 2 ohm impedance and S8-4 with 4 ohm impedance for improved system composition versatility. 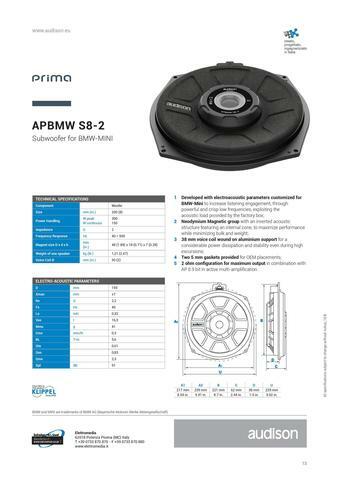 In fact, in the mid-high passive filtered system configuration, with the crossover provided, 4 of the 8-channels of the AP 8.9 bit can be configured in bridge mode delivering 130W rms to each S8-4 installed under the seat. The S8-2 can be used in a fully active, multi-amplified front system, maximizing the power of the AP 8.9 bit at 2 ohms, and employing additional 2 channels for the rear system. 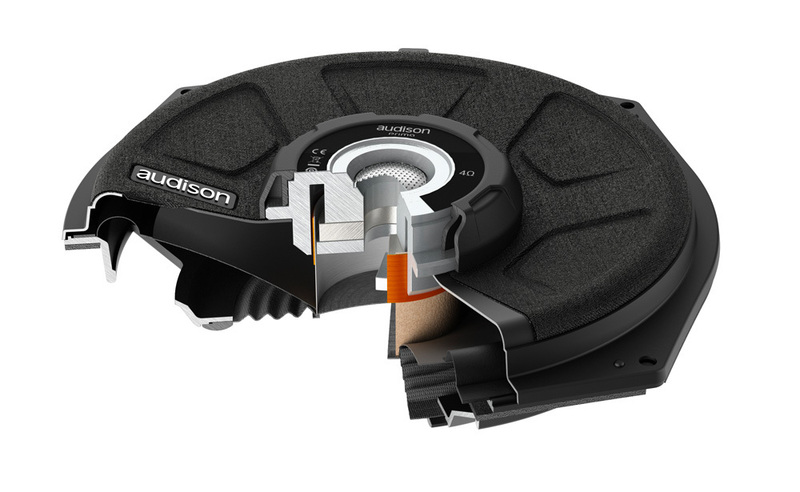 The Neodymium magnet used on S8-4 and S8-2 allows for greater power and control than ferrite, while maintaining the depth of installation unaltered.